C. Halei Torr. ; Britton, Bull. Torr. Club 13: 213. 1886. Annual, culm stout, 2°-3° tall, about equalled by the leaves. Leaves 3"-4" wide, very rough-margined, those of the involucre 5-8, much elongated; umbel compound, several-rayed; spikes cylindric, sessile or very nearly so, exceedingly dense, 1/2-1' long; spike-lets very numerous, linear, 1 1/2"-2 1/2" long, 1/2 wide, spreading; scales brown, keeled, indistinctly 5-nerved, oblong, mucronulate, separating from the rachis at maturity, the wings of the rachis separating as a pair of hyaline scales, as in the preceding species; stamens 3; style 3-cleft; achene 3-angled, minute. In swamps, southern Missouri to Tennessee, Louisiana and Florida. 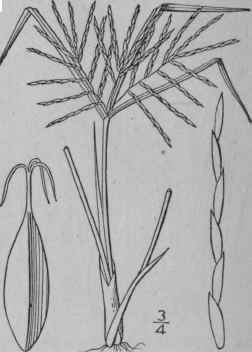 July-Sept.
Cyperus speciosus Vahl, Enum. 2: 364. 1806. C. Michauxianus Schult. Mant. 2: 123. 1824. Annual, culms usually tufted, 1'-2° tall, reddish toward the base. Leaves rough-margined, 1 1/2"-2 1/2" wide, shorter than or equalling the culm, the midvein prominent; leaves of the involucre much exceeding the umbel; umbel compound or nearly simple, 3-7-rayed, the primary rays 1/2' -5 1/2' long; involucels narrow; spikelets subterete, very narrowly linear, loosely or densely clustered, 4"-12" long, less than 1" thick, 10-30-flowered, falling away from the axis at maturity; scales dull brown or reddish, thin, densely imbricated, ovate, obtuse or acute, faintly 3-5-nerved on the back; rachis-wings broad, clasping the achene, persistent; stamens 3; style 3-cleft, slightly ex-serted; achene pale, 3-angled, about one-half as long as the scale. In marshes, Massachusetts to Ohio and South Dakota, south to Florida, Kansas, Texas and California. July-Sept. Sometimes flowering when 1' high; variable in the overlapping of the scales. Cyperus ferax L. C. Rich, Act. Soc. Hist. Nat. Paris 1: 106. 1792. 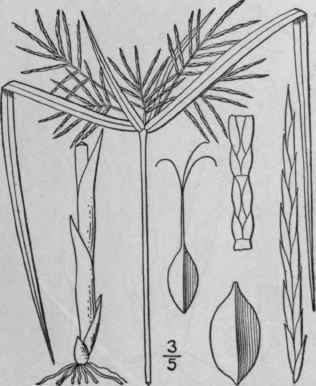 Annual, closely related to the preceding species, but with smooth-margined, shorter and broader leaves, those of the involucre sometimes but little exceeding the inflorescence, the scales of the spikelets less imbricated. Umbel simple or somewhat compound, often compact, the rays mostly short; spikelets linear, sub-terete, 10-20-flowered, 8"-12" long, about 1" thick, falling away from the axis at maturity; scales ovate-oblong, appressed, slightly or scarcely imbricated, obtusish or acute, rather firm, green and 7-9-nerved on the back, yellowish on the sides; stamens 3; style 3-cleft; rachis broadly winged; achene 3-angled, narrowly obovoid, obtuse. In wet soil, Massachusetts to Florida. California, and widely distributed in tropical America. 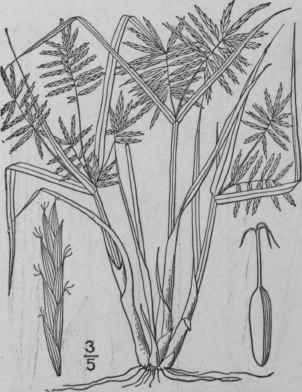 Aug.-Oct.
Cyperus Engelmanni Steud. Syn. PI. Cyp. 47. 1855. Annual, culms slender, 6'-2 1/2° tall. 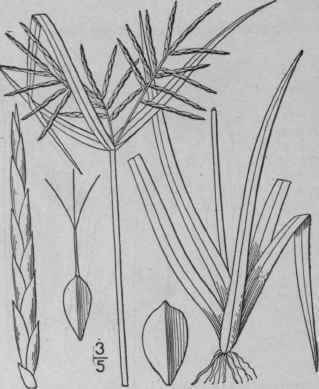 Leaves elongated, 2"-3" wide, flaccid, roughish on the margins, those of the involucre 4-6, the longer exceeding the umbel; umbel often compound, the raylets very short; spikelets often densely crowded, very narrowly linear, subterete, 6"-12" long, 5-15-flowered; rachis narrowly winged; scales greenish-brown, oblong, obtuse, thin, faintly 3-5-nerved on the back, distant, the successive ones on each side of the spikelet separated by a space of about one-half their length; stamens 3; style 3-cleft; achene linear-oblong, 3-angled, two-thirds as long as the scale. In wet soil, Massachusetts to southern Ontario and Wisconsin, south to New Jersey and Missouri. Aug.-Oct.